The Nest Cam IQ Outdoor is the smartest security camera we've tested, using a 4K sensor, motion tracking, and facial recognition to protect your home while weeding out irrelevant notifications. Crucially, it's also incredibly easy to use, and is built like a brick. There are more affordable alternatives, but none matches the IQ Outdoor's smarts and design. Last year, Nest launched one of the most intelligent Wi-Fi cameras on the market, the Nest Cam IQ. It aimed to make your home more secure with the help of facial recognition, a 4K image sensor, and person-tracking. Now the Google-owned company is extending that intelligence outside, with the Nest Cam IQ Outdoor. The Nest Cam IQ Outdoor is essentially a redesigned and more intelligent version of the brand’s existing Nest Cam Outdoor, with a redesigned exterior and added features to give you extra piece of mind. It works seamlessly with the same Nest companion app, although to get the most from this new device you’ll have to sign up for the Nest Aware service, which is an additional monthly cost on top of the already expensive camera. So does the IQ Cam Outdoor live up to Nest’s lofty promises? We installed one in our garden to find out. 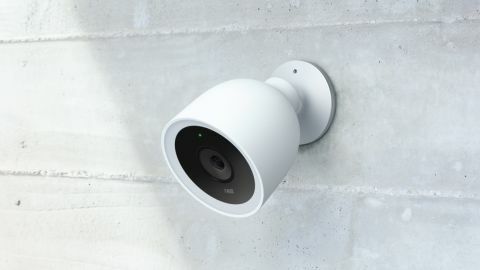 The Nest Cam IQ Outdoor is available now in the UK and US; we don't know about availability for Australia yet, but as Nest's other cameras are available there we expect it to arrive in due course. The Nest Cam IQ Outdoor looks very similar to previous Nest products, so if you own any of those it’ll fit right in. It’s aesthetically most similar to the indoor Cam IQ and standard Cam Outdoor, although perhaps the biggest difference if how large this camera is. At 9.3cm (3.7 inches) in diameter and 12.8cm (5 inches) long it’s clearly not going to get missed on the side of a building, which is a good thing if you want to deter potential burglars, but not so good if you want something more subtle. It’s heavy, as well, weighing in at 568g (20oz). This helps make it feel incredibly solid and well put-together. It’s rugged, and weatherproof to an IP66 certification. That’s up from IP65 on the standard Outdoor Cam, and means it’ll survive in a downpour. It’s also capable of operating in temperatures from -40°C to 45°C (-40°F to 113°F), so unless you live somewhere pretty extreme you shouldn’t need to worry about the weather. The Nest Cam IQ Outdoor comes with a base that can be screwed to your wall, and which provides a magnetic docking station for the camera. Once in place, the camera can only be removed from the base by using a proprietary tool. The power cable can be fixed one of two ways, either into the side of the base and along the exterior wall, or directly through the wall into the back of the base; this second option was a much-requested feature, apparently, and ensures the power supply can’t be tampered with. It comes with a 7.5m (25ft) USB-C to USB-C cable. The Nest Cam IQ Outdoor features a 4K HDR sensor, but the highest resolution you’ll actually see is 1080p. This downsampled image is what allows Nest to include all of the additional intelligent features, such as close-up tracking (where the camera automatically zooms in on motion) and 12x digital zoom. IR sensors around the lens ensure that it can see clearly in the dark up to 10 meters away, and a high-quality loudspeaker and three microphones are built in for two-way audio communication. When using the two-way communication function, a bright blue LED ring will illuminate around the lens, another feature designed to deter potential burglars. Perhaps the most useful function of the Cam IQ Outdoor is that it packs facial recognition. Adding trusted faces enables you to customize notifications, so that you only get notified of unfamiliar guests or intruders. Another thing that sets the Nest Cam IQ Outdoor apart from similar products is the slick Nest app for iOS and Android. It’s the same app that you use to control your thermostat and smoke alarm, and it’s clearly several notches above the competition. The app shows you a live feed from your cameras, and, if you pay for a subscription to Nest Aware, you can customize your notifications by setting up to three active motion zones. These are areas within the camera’s view which can be drawn and designated as sensitive to movement. You won’t find a microSD card slot for local video storage here, as all footage is stored in the cloud. Nest Aware is subscription service that unlocks access to advanced features with an extra layer of intelligence (such as custom activity zones, familiar face alerts, and person talking or dog barking alerts), as well as 5-day, 10-day or 30-day continuous video history. This service costs £4/$5 per month or £40/$50 per year for five days of cloud backup for video, £8/$10 per month or £80/$100 per year for 10 days of backup, or £24/$30 per month or £240/£300 per year for 30 days. Nest includes everything you need to install the Cam IQ Outdoor, from the screws and wall plugs that fix the magnetic base to the wall to the cable clips that keep the USB-C cable close to the wall. If you’re going for the neatest and most secure installation, you’ll have to drill from the outside of your house through to the inside. If you’re not confident doing that, Nest offers a professional installation service. Getting the camera online is made easy by the Nest companion app, which takes you through the set-up step-by-step. Once set up, you’ll be using one of the best smart home apps in the business. It’s slick, well-designed software that works without many hiccups. The image quality from the Cam IQ Outdoor is some of the best we’ve seen, with the camera recording 1080p at a solid 30 frames per second. Whereas we experienced some buffering issues with the standard Nest Cam Outdoor, the IQ Outdoor has greatly improved connectivity thanks to a 2x2 MIMO chip. The high-power 850nm infrared LEDs ensure you get excellent video quality in complete darkness too, something cheaper cameras struggle with. As for audio, the microphone is sensitive enough to pick up subtle sounds, while the speaker delivers a clear voice when you talk via your phone. The Nest Cam IQ Outdoor feels incredibly well made, and is guaranteed to survive in the harshest weather conditions. The 7.5m cable is useful, and the strong magnetic bracket is an reassuringly secure way to fix it to a wall. Picture quality is excellent both by day and by night, while motion tracking and facial recognition are super-useful features which actually work. Another big plus is the impressive app. The Cam IQ Outdoor could be difficult to install, especially if you’re a DIY novice, while there's no getting around the fact that this is expensive an expensive security camera – and while the initial outlay is steep, to get the most out of the camera you also need to take out a subscription to Nest Aware, which is an additional cost. The Nest Cam IQ Outdoor is easily the most intelligent home security camera available. Not only does it boast a number of useful features, such as facial recognition and motion zooming, but it’s backed up by the most user-friendly companion app we’ve tested. The only problem is that it’s also the most expensive camera we’ve tested, and unless you pay for a subscription you can't access all of the camera’s features, which is a tough pill to swallow. Having said that, we think it’s worth every penny.